So here is my second variation on the Plantain pattern for the Deer&Doe sewing contest. I created a yoke with scalloped edges and changed the neckline to a bateau or boat neckline. The scallops are kind of appliqued to the striped portion of the top by using a zig-zag stitch around the edge. I used a grey and cream striped fabric which is a bamboo rayon blend — oh so luxurious! It feels amazing and drapes beautifully. The cream fabric for the yoke and short sleeves is just a simple cotton interlock. Both fabrics were purchased at Dressew. This was an interesting project for me to sew. Trying to figure out how to sew the scallops onto the striped fabric gave me a bit of a headache but I persevered. The knit fabric made it a lot more trickier than if it had been a stable woven fabric. Anyways, I certainly had a lot of fun participating in the contest. I don’t know if I’ll try to participate in any more in the near future. What I really have to do is take stock of my wardrobe and figure out where my sewing focus should be this year; try to fill in the gaps and focus on what my personal style is. 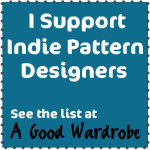 I read this blog post on the Colette Patterns blog which is a part of their new Wardrobe Architect series. It really got me thinking and wondering about what my core style is. It’s definitely girly and whimsical with a touch of vintage, a touch of goth/rocker edge, and a touch of clean contemporary lines. It seems like such a strange mix but it works for me, for the most part. It’d be nice to go through my whole wardrobe and figure out what the heck I’m actually doing with my personal style! Earlier this month, the France based sewing pattern company Deer&Doe released a free t-shirt pattern which they’ve named Plantain. To kick off the release, they’ve decided to host a sewing contest. The challenge is just to create your own version of the Plantain pattern. Here is one of my entries (yes, I’m actually working on a second one!). I lengthened the t-shirt pattern into a dress and added a gathered ruffle to the bottom. I also changed the oval shaped elbow patches that were designed for the pattern into red heart-shaped patches. In essence, I’m literally wearing my heart on my sleeves! The dress is sewn from a nice navy jersey I found at Dressew. It’s so soft! I love the fabric and it wasn’t too expensive either, just $7/m. I only used 1.5m for this dress. The heart-shaped elbow patches are made from leftover bits from my Olivia dress. The winner of the contest wins a couple of gift certificates, one to the Deer&Doe store and the other to a fabric store that sells pretty organic fabrics. I don’t know if I’ll win but I’m so happy with how this dress turned out. I love how pretty and simple it is and since it’s made from jersey, it’s so comfortable and wearable for all sorts of situations. Anyways, wish me luck but even if I don’t win, I’ve already come out a winner from having participated in the contest. It was a challenge that engaged my creativity and pushed me to meet a deadline. And now I have a cute dress! For the month of December and part of January, I switched gears and threw myself into a bunch of knitting projects. Sewing went on the back burner but don’t worry, there are a couple of projects brewing right now…They should be revealed by the end of the month. All the things I knit were gifts for other people. I know! All that work and I don’t get to keep any of it. It’s okay, I know my gifts were well received and my intention for knitting these projects was to make something thoughtful for my recipients. I knit two triangle shawls, both patterns are designed by a local Vancouver designer (and fellow coworker!) Sylvia Bo Bilvia. She’s a very talented designer who has made a lot of splashes on Ravelry and in Vancouver’s local knitting scene. Her most famous design by far is the The Lonely Tree Shawl. I knit my own version of this shawl, altering it slightly so that the leaf design was symmetrical. My Ravelry notes can be found here if you want to read about the nitty gritty details on the project. This is what the shawl looks like while it’s blocking. Blocking is the procedure where you gently wash your finished knit garment and then lay it out somewhere to dry. You can also use pins or wires to give your project some shaping and “open up” the knitting. Lace patterns usually need to be blocked to open up the lace and help it look even more beautiful. As you can see, I bought a set of foam mats from a children’s toy store to use as blocking mats. You can use pretty much anything, as long as you can pin into it. These were just the most affordable for me…and aren’t they just so silly and cheery! The second shawl I knit was The First Few Fallen Leaves. My Ravelry notes here. I used both Cascade 220 Heathers to knit the shawls; it’s an affordable worsted weight wool yarn that I bought at one of my local yarn stores, Three Bags Full. The Lonely Tree one was knit in the colour way Peacock and the First Few Fallen Leaves was knit in Saphire. These shawls have been the largest projects I’ve successfully completed knitting so far and I’m pretty proud of the intricacy of the lace I was able to knit. I do actually have a sweater that’s in my UFO pile and I hope to finish it in February…maybe. I also knit these! They’re double-sided Star Trek pot holders. Ravelry notes! To achieve the reversible double sided mirror imaging effect, these pot holders were knit using a technique called double knitting. You knit with two strands of yarn held at the same time and switch back and forth between them depending on which colour you want to show up on the side that’s facing you. The other colour will end up on the other side. Yea…it’s kind of mind-blowing to think about the mechanics of double knitting. I am becoming quite the knitting nerd…and I love it! I am actually going to knit one more Lonely Tree shawl for my grandmother. It’ll be a Chinese New Year gift and I’m knitting it in red yarn of course. I really love knitting and I’m glad I decided to pick up the hobby back in April 2012. The only thing is that I go long gaps without doing any knitting so in total, I probably only have about 7 months of knitting experience. I’m hoping to knit more regularly in 2014 and have it as a background hobby to sewing. I’d like to do one sweater project per season and I think that’s a reasonable time allowance — 4 months to knit a sweater? That sounds doable! Feel free to creep my Ravelry profile to learn more about my knitting. You will see from creeping that I started off with lacy dishcloths as my first projects. So here’s to knitting! Hurrah!